Life would be sweet cruising Lake Allatoona on our own yacht, zillion-foot houseboat or sleek sailboat on long vacations. Most of us will have to settle for comfortable, clean and convenient lodging near Woodstock. Sorry. 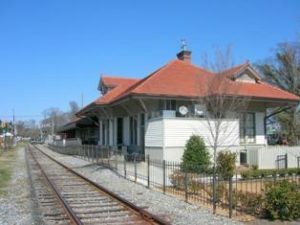 The overnight lodging at Woodstock does not include sleeping in the old train depot. No, this isn’t the renowned hippie haven from the 1970s. Our Woodstock has plenty of places to choose from for dinner. Great music is never far away. The traffic isn’t backed up for 50 miles. Our Woodstock also has an abundance of places to stay indoors, in case it rains. Our Woodstock is the best. Woodstock has a vibrant downtown … home to one-of-a-kind dining and shopping experiences. In the historic setting of downtown, you will find more than 30 unique locally owned shops and many great deals.